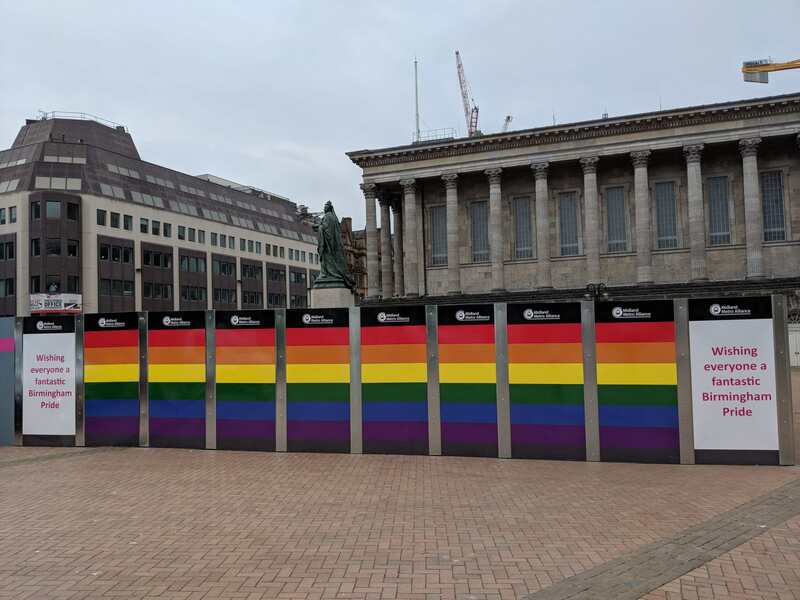 The hoarding in Victoria Square is part of the Birmingham Westside Extension site, which is one of the five extensions that make up the ambitious metro extension programme. 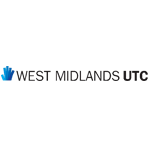 The Metro expansion is being planned, designed and built by the Midland Metro Alliance on behalf of Transport for West Midlands and will see the Metro network triple in size by 2026. 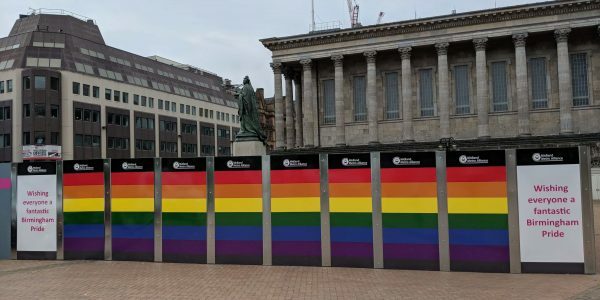 The pride hoarding has been designed by the organisation to celebrate Birmingham Pride, which hosts its 21st celebration for the local LGBTQ community between Saturday 26 and Sunday 27 May 2018. 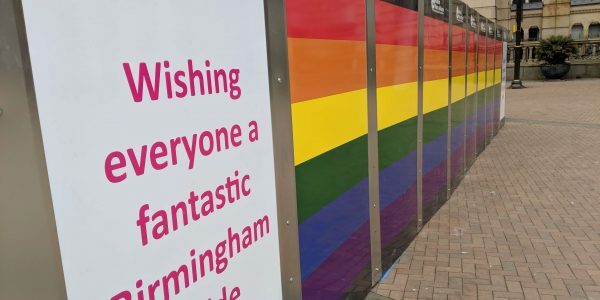 The rainbow design is in pride of place for the “Be You” Birmingham Pride Carnival Parade which sets off from Victoria Square at noon on Saturday 26 May. 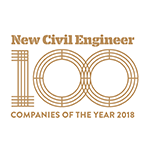 The hoarding is also designed to make more LGBTQ individuals consider careers in the construction, civils and transport industries, which are often viewed as being less diverse than other sectors. For example, a report from 2015 revealed that only 14 per cent of gay employees felt that they could be open about their sexuality in the workplace. 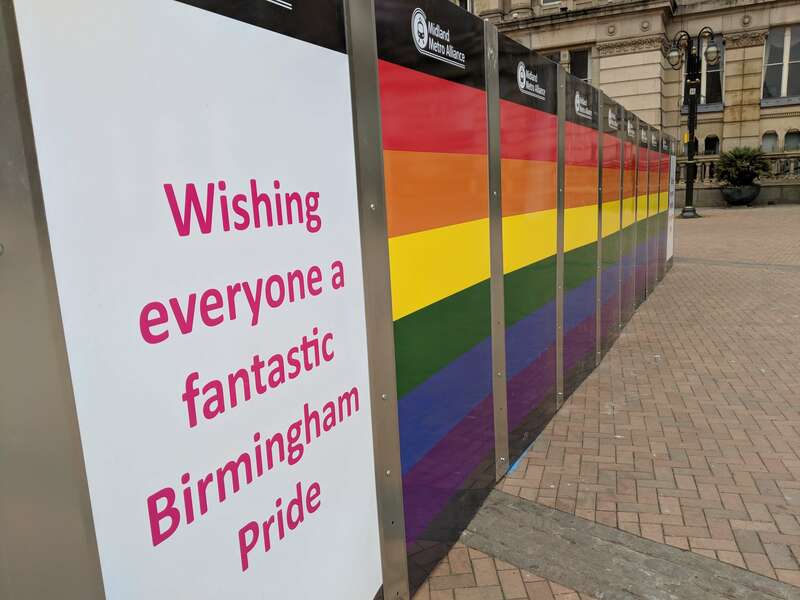 To allow the Birmingham Pride Carnival Parade to cross Corporation Street, trams, operated by National Express Midland Metro, will terminate at Bull Street between 11:00 and 14:00 on Saturday 26 May. 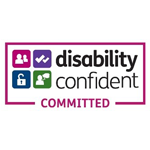 National Express, Transport for West Midlands and the West Midlands Combined Authority will also all be part of the parade which runs from Victoria Square to the south side of the city centre. Tickets, and more information, for the two day festival located in Birmingham’s Gay Village, are available online at www.birminghampride.com.